India A 4-217 (Unmukt Chand 59, Mandeep Singh 59, Ashok Menaria 37*, Mark Gillespie 2-62) beat New Zealand A 216 (Carl Cachopa 80, Luke Ronchi 34, Ashok Menaria 5-38) by six wickets. The Black Caps A scored 216 runs before they were bowled out in 47.2 overs and the Blue Shirts A thrashed 217 for the loss of just four wickets and 11.1 overs still in hand. The second unofficial One Day International was played on Tuesday, September 10, 2013, at VDCA Cricket Stadium, Visakhapatnam. 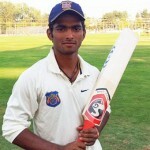 Eralier, Unmukt Chand, the captain of India A, won the toss and invited New Zealand A to bat first. The visitors lost their first wicket at five runs when Luke Ronchi and Carl Cachopa tried to consolidate the innings. They scored 47 in 9 overs with 1 six and 6 fours when Ronchi was gone for 34 off 32 balls comprising 1 six and 5 fours. The middle order batting revolved around Cachopa as the wickets kept on crumbling at the other end while sharing small partnerships. The Kiwis A were 5-120 after 29.1 overs as their skipper Andrew Ellis joined in with Carl Cachopa who reached his third List A fifty in the 31st one. The batsmen were unable to score freely and the boundaries were dried up for many overs. They crept to 187 in 41.5 overs as Carl Cachopa was caught by Mandeep Singh at mid-wicket off Ashok Menaria for 80 from 103 with 9 fours. Andrew Ellis scored 34 as the entire New Zealand A team was sent back to the pavilion for 216 with 16 balls to spare. Ashok Menaria was the star performer with five wickets, Dhawal Kulkarni held two whereas Basant Mohanti and Sandeep Sharma shared one wicket each. India A opened the innings with Robin Uthappa along with Unmukt Chand and the first was dropped by Tom Latham on the fourth ball. Chand got two boundaries in the initial two overs and Uthappa added 11 runs in the next with 1 six and 1 four but surrendered after scoring 12. The second wicket fell at 44 in 8.4 overs when Mandeep Singh got together with Chand who dispatched his second six and 2 fours in the following overs. Mandeep Singh accumulated 14 runs in the 12th over with 1 six and a couple of fours as the first hundred of the innings was posted on board eight overs later. Unmukt Chand attained his 7th List A half century in the 21st over while Mandeep Singh kept on cruising at the other end. The score was enhanced to 133 in 25.5 overs when Chand was clean bowled by Adam Milne for 59 off 71 deliveries with 2 big sixes and 7 fours. Kedar Jadhav walked in next and opened his account with a four whereas Mnadeep Singh registered his 9th List A fifty on the first ball of the 29th over. Jadhav got a life at 11 and the duo gathered another 11 runs in the 31st one with 1 six and 1 four. The stumps of Mnadeep Singh were uprooted by Matt Henry for 59 off 69 with 1 six and 9 fours and he was replaced by Ashok Menaria. The latter was the most aggressive of the two and hit 4 fours on the first 18th ball he faced whereas the score went past the 200 runs mark in the 38th over. Kedar Jadhav hit the winning four and remained unbeaten for 30 off 34 balls with 1 six and 3 fours. Ashok Menaria secured his end for 37 off just 30 with 7 fours as the hosts smashed 217 with six wickets still in hand in 38.5 overs. Mark Gillespie was the top wicket taker with two whereas Adam Milne and Matt Henry got one each. India A grabbed the second unofficial One Day International with a big margin of six wickets and leads the three match series 2-0. The third and final game will be played at the same venue on September 12, 2013.